.... هذه الطريقة تفيد جدا أثناء تصفحك على الانترنت ..
فيمكنك مشاهده الفيديو وانت تتصفح وهذا ما يسمى خاصية " on top"
With Windows Media Player 10, you can use the mini Player when you want as much room as possible left on your computer screen for other programs you're using. 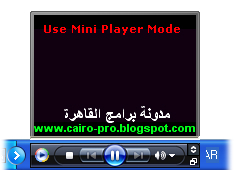 When you use the mini Player, the Player minimizes to the Windows taskbar, but you can still access playback controls and view visualizations and information about the currently playing item. أختر أشرطة الأدوات " Toolbars"